My view : This was an interesting read, with the backdrop of an age old civilisation that has always fascinated me. Mohenjo-Daro or the mound of the dead, has been a mystifying source for most archaeologists. This thriller is derived from events that could have triggered the fall of the Indus valley civilisation and would have invariably brought about anarchy in the current world. What charms me is the engaging beginning of the book. A handful of archaeologists are digging up an excavation site at Mohenjo-Daro. Regular monitoring and excavating activities are going on at the site, when a sudden discovery leads to mayhem. The disastrous accident or pre-planned murders give rise to unnecessary press releases and a seemingly over-the-counter YouTube video. Nadia finds herself in the middle of this with her sister being a victim in the accident. Nadia’s struggle with the present scenario, her past and the recurring prophetic dreams of a woman named Jaya is what constitutes the rest of the book. 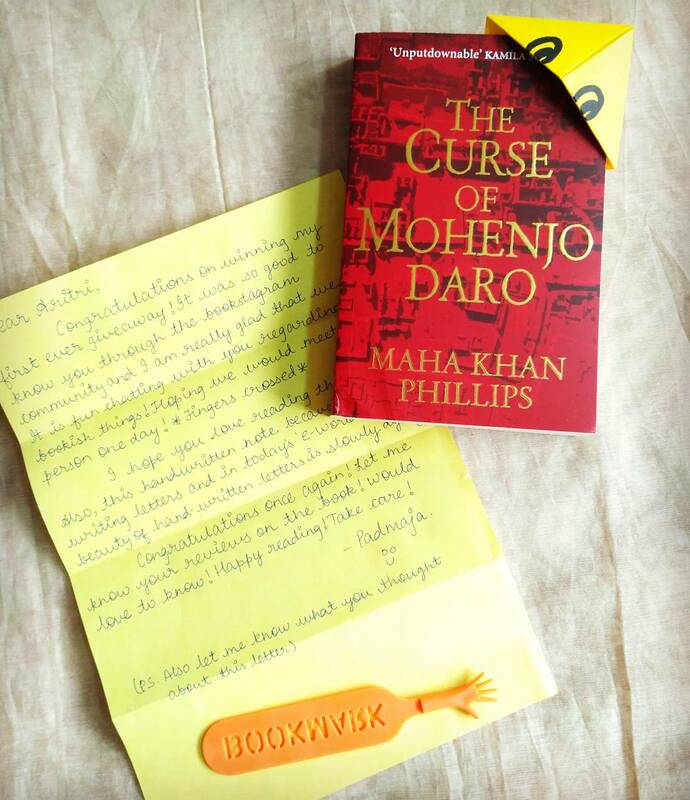 The Curse of Mohenjo-Daro reminded me of the Millennium series, not because of similarity in plot (they were as unlike as possible) but ’cause of the potential this book had. Had the characters and plot twists been tapped into properly, this book could have been a masterpiece of a thriller. Nevertheless, it got me hooked the entire time. I was thoroughly intrigued by the 3800 BC and the beautiful way the ending was portrayed. There is no way that I can complain about the theme or the plot of the book. My only regret was the characterization. With the powerful writing the author showed, I am sure she could have brought out more depth in the characters of the cold-hearted murderer Philip or the lone survivor Nadia. Thanks to @thebookishtales I received this pretty book mail as a giveaway prize. Thanks a lot 😊 I am glad you liked it.